So, today we drove 3 hours to go to the christening of our nephew/cousin (on hubby's side) and then 3 hours home again! Sigh! I was not looking forward to that much time in the car as A1 doesn't really sleep int he car anymore (he's almost 7), A2 has never been a good car sleeper, usually falling asleep 5-10 minutes before reaching our destination and A3 looks to be following in his sisters footsteps. So, I packed snacks (fruit, crackers, water, sultana and seed mix, plain popcorn, and finally a couple of prepackaged snacks if we got desperate!) and I thought about what would keep them busy on the trip. Well A1 and A2 being 6 and 3 I decided to pack the MegaSketcher. I figured it was less messy than colouring in the car and we wouldn't need to sharpen anything! lol! And I also decided to pack a clipboard with some travel games. I printed them off on cardstock (some from the RACV website and various others) plus some blank A5 paper and I decorated an A5 clipboard for each of them. I also packed a few crayons (figured this was simpler than pencils re sharpening) for them to complete the bingo sheets or draw with. 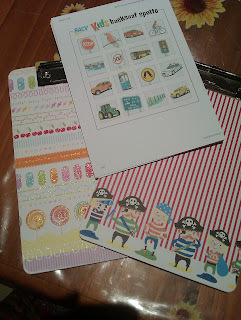 I covered some cute wooden clipboards (from Officeworks) with some scrapbooking paper (love the Tombow multi-adhesive!) and just sanded the edges a little where the paper overhung. I will probably sponge them with some matching ink, but they were fine for the moment. I wondered how long until they asked for Daddy's phone (they know he can play videos on there!) but I was pleasantly surprised!